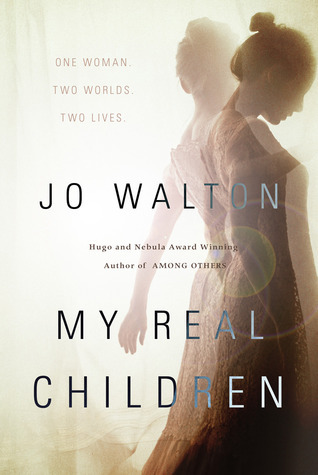 I liked Jo Walton’s latest so much that I thought about just posting the last page of the book on here, because I’ve rarely seen one that was finer. Well, except for the last line, which turned the screw a bit too much. Posting the last page of a book is the kind of thing you can do with a literary novel, but not with a genre novel, so I won’t (even though it’s not a heavily plot-driven book. Anyway, I am so tired. Abysmally tired. I went to bed in good order last night, but only slept five hours. The night before that, I only slept three. Not sure what’s up with that. It doesn’t really matter, since it’s not like I have a job to go to. But it does not feel good to be tired. And, for some reason (maybe because my room gets too much sun), I’m no longer able to engage in daytime napping. So, because of that, I won’t be able to give this book the thorough treatment it deserves. Suffice it to say, it’s really good. Certainly the best SF/F book published in 2014 that I’ve yet read. I’m going to nominate it for a Nebula. The book has a simple conceit. A woman is born in the UK in the late 1920s. At some point early in her life, she faces a momentous decision. At that point, her timeline splits and her life (along with the fate of the entire world) diverges. This is a very personal story. It’s about loves lost and found; careers made and broken; children who are born and grow up and have children of their own. There are also nuclear bombs and moon bases. Interestingly, neither of Patty’s worlds–the two that are chronicled in the book–is our world. However, one of them is similar enough to our world that it’s a bit strange and confusing. I like the effect. It’s lovely. The human story here is really engaging. You genuinely want to know what Patty is up to and what will happen to her. And the point counterpoint between the two stories is interesting enough that it can take the place of conflict or plot. One of the lives is much happier than the other. In that one, Patty faces nothing like the troubles that she faces in the other one. But you don’t care, because there’s something fascinating about seeing the same person take two such different routes. The book is so engaging on a page by page level that you’re able to ignore the strangeness of the premise. In the end, though, it does roll back around and try to make a point (perhaps too clearly). What I like best about the book, in looking back on it, is the way it differentiates personal happiness from societal well-being. In all too many SF/F, the social order serves as a sort of pathetic fallacy (i.e. the nature of the world reflects the nature of the character’s internal states). If a world is authoritarian and dark, then the people feel repressed and depressed. If a world is shiny and glitzy, then they’re optimistic and happy. In reality, though, happiness has much more to do with your home life and your professional life than it does with the social order. I remember another book that made this point very clearly was Walter Mosely’s Futureland, which took place in a horrifying corporate dystopia where, nonetheless, some people managed to be very happy. Anyway, read this book. It’s great. The book I’d most closely compare it to is John Williams’ Stoner, which is another broad sweeping story about an entire human life. However, Stoner is more Romantic. It idealizes the main character’s unhappiness too much. It tries to turn him into a hero. This book doesn’t have to do that, because it has two main characters. It has the happy version and the unhappy version. And they’re both heroic and unheroic in different ways. Okay, I guess I did have a lot to say. Interesting comments about personal and societal happiness. I can think of other SFF where that happens too, but people’s feelings themselves are not the focus of the story, so I guess it’s something different here. I will have a go at it, thanks.